Taste Of The Wild Wetlands Canine Formula with Roasted Fowl is a flavorful and balanced blend of roasted quail, roasted duck and smoked turkey. This grain-free, unique protein formula with sweet potatoes, fruits, and vegetables provides highly digestible energy and natural antioxidants for your sensitive dog. 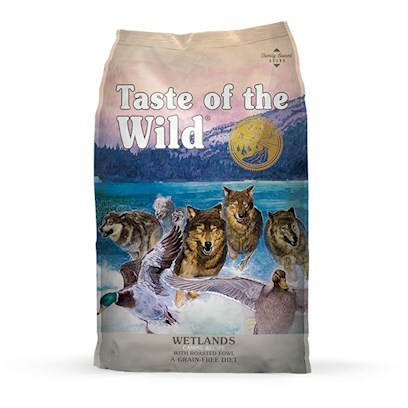 Because Taste of the Wild Wetlands Canine Formula with Roasted Fowl is made with tasty unique proteins, your dog will lick their lips in anticipation of the flavor. Your dog deserves the delicious balanced nutrition of Taste of the Wild Wetlands Canine Formula with Roasted Fowl. Duck, duck meal, chicken meal, egg product, sweet potatoes, peas, chicken fat (preserved with mixed tocopherols), potatoes, roasted quail, roasted duck, smoked turkey, natural flavor, tomato pomace, ocean fish meal, salt, choline chloride, dried chicory root, tomatoes, blueberries, raspberries, yucca schidigera extract, dried Enterococcus faecium fermentation product, dried Lactobacillus acidophilus fermentation product, dried Lactobacillus casei fermentation product, dried Lactobacillus plantarum fermentation product, dried Trichoderma longibrachiatum fermentation extract, vitamin E supplement, iron proteinate, zinc proteinate, copper proteinate, ferrous sulfate, zinc sulfate, copper sulfate, potassium iodide, thiamine mononitrate (vitamin B1), manganese proteinate, manganous oxide, ascorbic acid, vitamin A supplement, biotin, niacin, calcium pantothenate, manganese sulfate, sodium selenite, pyridoxine hydrochloride (vitamin B6), vitamin B12 supplement, riboflavin (vitamin B2), vitamin D supplement, folic acid.